The colony has only two common toilets for the 11 families and does not have electricity except for streetlights that were recently provided connection. A passer-by would probably not even notice the steep but otherwise nondescript gravel path leading to Pulaparakunnu Colony, though it is just off the main road. To reach the houses in the colony from the gravel path, you take a narrow lane through which barely two people can walk at a time. 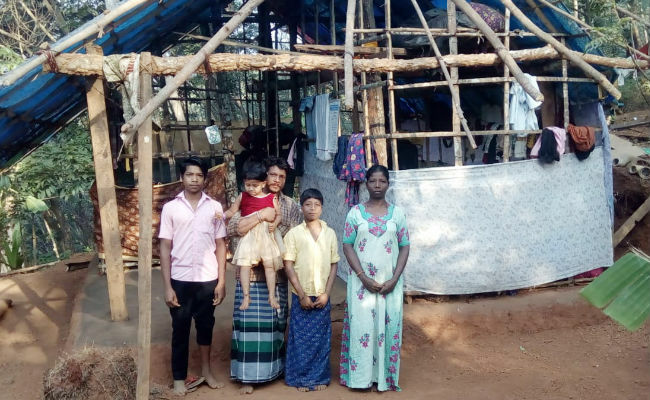 The colony, located in the 14th ward of Meppayur panchayat in Kozhikode district, is home to 11 families belonging to the Sambava Scheduled Caste community. 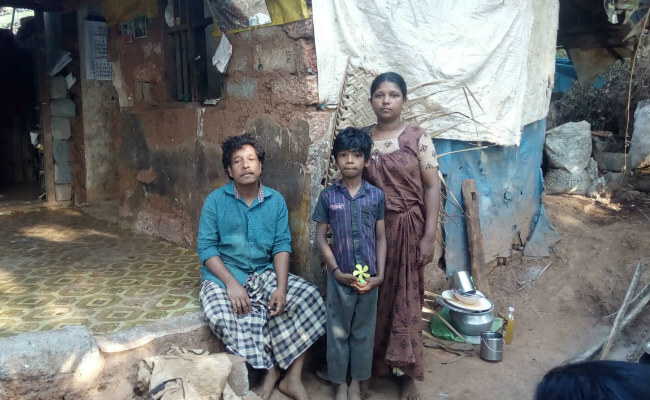 These families have been living right in the middle of a mainstream society but neglected by authorities and barely noticed by their neighbourhood. When we reached the colony, which is nearly 40 km from Kozhikode, it was past 6 pm. The families, who have been living in the colony for generations, have been denied all basic facilities. There is no electricity, the houses have thatched walls or walls ‘set up’ with old sarees or tarpaulin and roofs of asbestos or tarpaulin. There are only two toilets that are shared by all the residents. They don’t use anything that requires electricity. Three or four men have mobile phones and that is their biggest luxury. They charge the mobile phones at their place of work. All families are single income, with an average size of four. The men are daily wage workers while the women don’t go out for work, because negotiating the steep road daily is not an easy task. There is a solar lamp in every house around which the family members sat together. Eleven solar lamps were provided to the colony by Johnson Perumvannamuzhy, a differently abled person, two months ago. Till then the residents used to manage with candles. Bringing up children in such dismal circumstances is a tough task for parents. The 84-cent land was taken over by the Meppayur panchayat in 1974 for a rehabilitation project for families who were landless. The promise was that 50 cents of land would be given, and it was with this assurance that the 11 families started living on the hill that is Pulaparakunnu. “We have been living here for generations, can’t say when our great grandparents came here. So for us it is our land, where we have lived all these years,” Ratheesh, one of the colony residents, says. Though a water tank was set up some years ago, the valve through which the residents filled water was closed by someone. Due to this, again the residents had to negotiate the steep road to fetch water from houses on the other side of the main road. The women have been confined to their homes for they don’t have the time or energy to do anything else other than fetch water and do the household chores. The residents tell us that once a woman died from a heart attack while fetching water, which forced her family to move to another place. Later, in 2015, a tank with lesser capacity was set up. But its capacity was too meagre to meet the demands of the families and water supply was available only two or three days in a week. In the period between 1998 and 2000, two families got possession certificate for the land and of this one family got the title deed. The other residents nor the activists know how this happened. Though people who have been living on poramboke land over the years would get title deed and other documents for their land, this hasn’t happened for the residents of the colony. The only reason that can be attributed to this – the negligence of authorities to a group of people who are not aware of any pressure tactics. Since they don’t have documents to prove that they are the owners of the land, they haven’t been able to apply for any documents such as ration card or voter ID card. This has in turn deprived them of all the benefits that the government provides for SC communities. The traditional work of the residents is making mats with reed. “But it would be income generating only if the reed is provided free of cost, like some other panchayats are providing. But in Meppayur the authorities find some strange reasons for not giving it to us,” Suman, another resident, says. 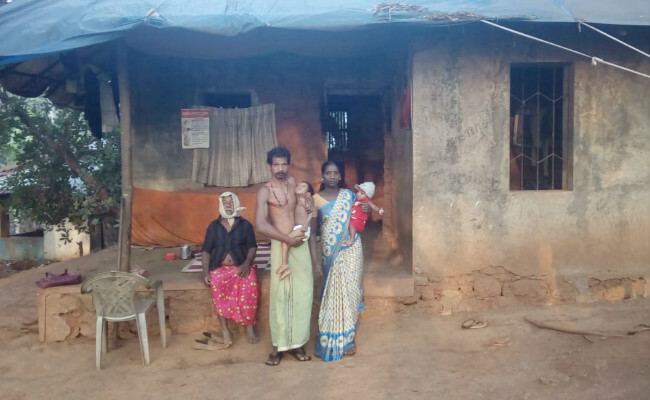 The residents began witnessing a change after some activists – Vineetha, Marcel and Ratheesh – noted the colony’s problems through a message reposted on a WhatsApp group. “We came to know about the hardships of the colony’s residents through a WhatsApp message. The sight we saw when we came to the colony on January 13 was that of a woman carrying water up the road. The next day we went to the panchayat office and discussed the issue with the authorities. Soon we set up a new valve for the bigger tank to provide them water. Now they can fetch water from the tank, no need to climb up the steep road,” Marcel says. On January 14, CPI (M) state secretary Kodiyeri Balakrishnan had come to Meppayur for an event. Minister TP Ramakrishnan was also present. At that time, Vineetha and Ratheesh brought the issues of the colony to their notice. The same evening, a team of people, including ward member Sreejaya, visited the colony. After that, electricity was provided to one out of the four posts in the colony with which they got streetlights. “We spoke to Kodiyeri and the minister at the event. Even for an electric post, minister level intervention was needed. Later many posts were put up on social media about it. The Collector, Sreeram Sambasiva Rao, noticed one of them and visited the colony on January 23,” Marcel adds. On March 1, the Sambava Maha Sabha Youth Movement provided 300-litre water tanks to each family free of cost so that they can store water. “The 35 people from the 11 families share two toilets. The two toilets were built in 2015 by Kin John, a Kochi native, after he came to know about their problems. 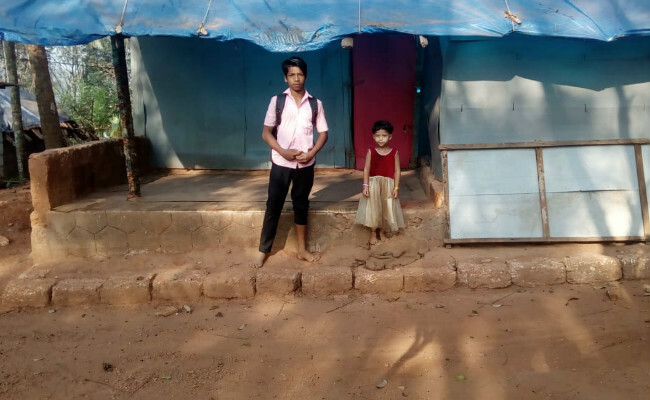 Before that, the residents used to go all the way to Parakulam, which is 4 km away, to use a canal for bathing!” says Shibu of the youth movement. Recently a Kudumbashree unit of the women in the colony was formed. It is still in the infant phase. The women are now hopeful that they will be provided some kind of assistance to start self- employment ventures like candle making, tailoring and the like. The Collector’s promise was action in one and half months, which he is keen to follow. The district judge also promised help. On February 22, an ownership certificate was provided by the panchayat for the residents. The document allows the residents to get a title deed for four cents of land for each family. They can produce it at the taluk office to get the title deed. They can also apply for ration cards and voter ID cards with the document. On Wednesday, officers of the district SC development office came to the colony to build a well using the SC corpus fund. As per the new plan, the colony will be converted to an Ambedkar village.